Sunday. So heading to my favorite teh tarik corner with roti canai is like usual routine stuff for me.Upon arrival, I notice my usual mamak outlet have added lotsa new thingy. A collection of special type of coffee that does more than taste good and keep us awaked. "It which supposedly enhance sexual performance of the drinker," as I been told by owner. 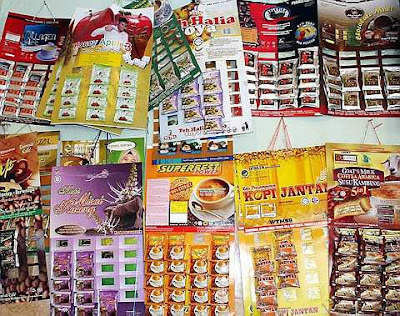 The more popular brands dominated the counter but the list is long and extensive and "containing herbs which have aphrodisiac elements" to boast performance. I , for one are not convinced but with RM2.50 and RM3.50 price tag . It destined to sell like hot cakes anywhere at Malaysia. One outlet even boast 50 varieties according to dailychilli.com. I rest my cases.